Hinsdale residents Giorgio (Gio) Arquilla and Zach Allen have always loved football. Gio, a senior at Saint Ignatius College Prep High School in Chicago, followed in his older brother’s footsteps to play Falcon Football. Zach, also a senior at Ignatius and Falcon Football alum, enjoys the complexity and diversity with every snap of the ball. Both were attracted to the mental and physical aspects of the game. 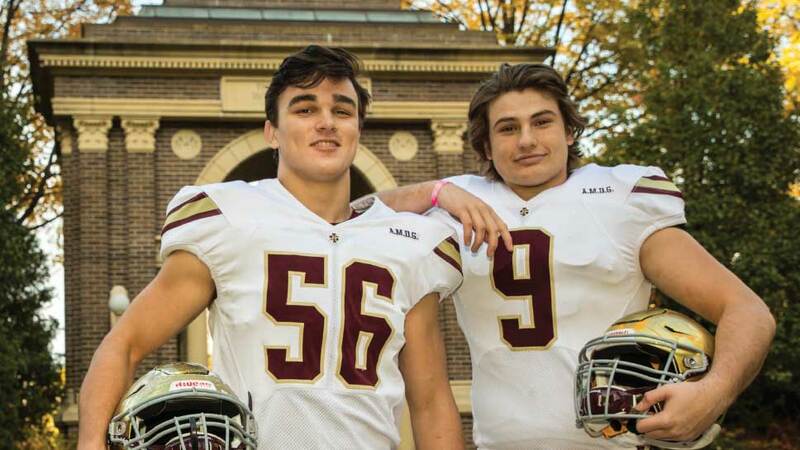 So perhaps it’s fate that these two Hinsdale seniors were named co-captains of the St. Ignatius football team and have since worked diligently to strengthen the program. These good friends hope to return to Ignatius someday to see the continued success of what they began. We sat down with them to talk football, life lessons, college, and beyond. Why did you choose Ignatius High School? Zach Allen: My family on my dad’s side has gone to Saint Ignatius since my grandfather. It’s tradition. Gio Arquilla: I visited the school as both my sister and older brother attended Ignatius. It is a beautiful campus. I tested for enrollment because of the athletic and academic opportunities it provides. It also gives me the opportunity to expand my horizon out of the “Hinsdale bubble.” It is a very diverse school where I am able to meet people from Chicago and the surrounding suburbs. What values were instilled in you at a young age, either through schooling, coaches or your parents, that you continue to live by today on and off the field? Zach Allen: I was taught the value of hard work in any pursuit. The fact that it takes no talent to be on time, well prepared, and hard working. Gio Arquilla: Hinsdale Falcons instilled the value of leadership and selflessness into my life. I won the Black Lion Award as a second grader on Falcons because my coaches wrote letters about my sportsmanship and athletic ability to its parent organization. I remember what they said about me and I have tried to uphold those characteristics through my high school experience. I have been named captain of the Ignatius Varsity team for the last two years, sharing the position with Zach. Leadership has always been a value I’ve associated with through my football experience and it continues to spill over into my everyday life. What kind of football program did you walk into at Ignatius and how have you helped amplify the program in your tenure as team co-captains there? Gio Arquilla: During my first year at Ignatius we experienced a true playoff season. We had a dedicated coaching staff who has an interest in developing us individually and as a team. Zach and I were lucky enough to experience it firsthand by playing up on the Varsity team as freshman. During our sophomore year, our team won the CCL Red Division, and during our junior year we won the CCL White Division. Last year our team participated in the Prep Bowl which is played between the Chicago Catholic League and the Chicago Public League. Zach and I have been nominated as All Conference Players the last three years and it is because of the dedication of our coaches and our team at Ignatius. Also, Zach and I are co-captains this year and have been friends throughout our time at Ignatius. We respect each other both on and off the field. Now, every regular season at St. Ignatius, we expect a playoff season as we have become a contender in our conference all due to the team, the coaches, and the off season conditioning staff. Do you have any plans to play football in college and if so, where? Zach Allen: I’m looking to use football to get me to somewhere that’s challenging academically and athletically, to play somewhere where I maybe couldn’t have gotten into without football. Right now, I’m particularly interested in Amherst, Tufts, Dartmouth, and Cornell. Gio Arquilla: Yes, I hope to play in the Ivy League and currently have multiple offers. My top choices include Dartmouth, Harvard, Tufts, and Georgetown. What advice would you give to younger kids just starting out in football programs? Zach Allen: Don’t lead with your head, come play at Ignatius. Gio Arquilla: My advice would be to listen to your coaches and take technique very seriously. I would also encourage them to make the extra effort every time they are on the field and off the field. It will help them to avoid injuries and play to the best of their abilities, never leaving a game disappointed by lack of effort.